A little while back Scott Watermasysk, preparing for the arrival of his first child, asked for advice on finding a really good compact digital camera. Funny how having a kid turns a geek’s thought to getting that perfect camera to capture the moment. 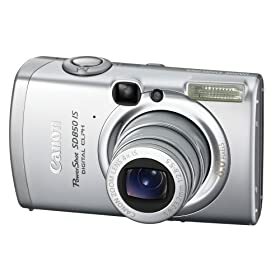 It was exactly what I did (but after Cody was born) when my wife and I purchased a Canon PowerShot SD850 IS Digital ELPH for Father’s day. Yeah, that’s a bit of a mouthful for a camera name, but the two letters that were important to me were I and Swhich stands for Image Stabilization. The SD850 combines that with a sensitivity range up to ISO 1600 for better photos in low light, a real problem area with my previous camera due to its suckiness and my incredibly shaky hands. Seriously, you don’t want me doing surgery on you. The other key features I was looking for was small in size (3.6 x 1 x 2.2 inches) so I can get all secret agent with it and face detection, for better portraiture. So far, I’m very happy with it. The pictures have been very sharp with good color. I should have known to stick with the ELPH series as my first ELPH took great photos despite only being 2.2 megapixel. This one boasts 8 megapixels (really more than I need) and 4x optical zoom. That there on the right is a picture of my son in a Brasil jersey given to him by my wife’s Brazillian coworker. Doesn’t he look sharp? Now you know why Brazil just beat the heavily favored Argentina in the Copa America. Cody Power! So, is the image stablization just a side affect of having a very high iso? or is there more to it than that. I'm in the market. My biggest complain is how my little optio pentax camera handles indoor pictures with out a flash (more than 10 feet). How does it do with that? any samples? @Peter - I believe it uses some compensation and a gyroscope for the image stabilization. My old camera was a Pentax and this takes much better indoor pics than the Pentax. When looking through the LCD, if you rotate the LCD, the pic will rotate too. It's pretty cool. I think there are at least two types of image stabilization, one that is purely digital correction (like many camcorders have had for a while) and another one that is optical/mechanical, where things actually move (or kind of float) inside the camera to suppress the shakes. How is the startup time? What about shutter lag? pretty nice camera. My sister got a very similar one before they had their child so they could take lots of pictures.